*Marvel: In 1972, Marvel launched many reprint titles, one of which, Jungle Action, featured 1950s stories of scantily clad white people bringing justice to the African wild, surrounded by grateful and subservient black folks. 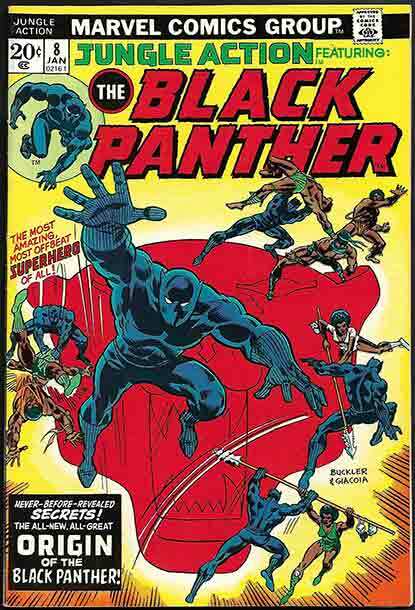 Realising belatedly this was a bit politically tone-deaf, Marvel abruptly swerved from #5, reprinting a Panther-centric issue of the Avengers, then from #6 presenting an all-new series starring T’Challa surrounded by political intrigue in his secret super-scientific society of Wakanda. 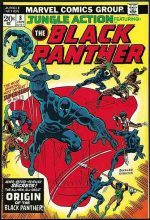 Although writer Don McGregor’s style could charitably be described as ‘overwrought’, the series won loads of acclaim at the time, and introduced key characters such as Killmonger who would prove important later, not least in the Panther movie smash. We have a virtually complete run of Jungle Action new in, missing only #5 from the series, but including #6 (VF+ £160), the first Killmonger and the first new Panther solo, #8 (VF+ £55), Panther origin, plus an array of bizarre and disturbing villains, including Venomm (not that one), Lord Karnaj and a bunch of other people whose names are actually spelled correctly!